March 30, 2017: Sunshine Holdings PLC is celebrating its 50th anniversary today, the group had its humble origins as a retail pharmacy in Gampola town in 1967. Today, Sunshine Holdings has become a leading conglomerate Sri Lanka by diversifying its roots of expertise into agribusiness, healthcare and consumer sectors. Since its beginnings, Sunshine Holdings has weathered many storms by seizing opportunities to evolve, reinventing their strategies, building superior brands and actively driving innovation across the entire spectrum of its operations. The organization has also gained invaluable recognition among its peers for fostering responsible entrepreneurship and strong family values that has paved the way for Sunshine Holdings to become a true people-centric conglomerate. Expressing his views on this remarkable milestone, Mr. Vish Govindasamy, Group Managing Director of Sunshine Holdings PLC said, “Since the formation of this company in 1967, we have been fueled by an entrepreneurial spirit and it is this very sprit that has empowered Sunshine Holdings to push the envelope and enter into groundbreaking strategic partnerships with local and global companies in order to further develop our growing presence in key business areas and deliver superior products and services to our consumers. 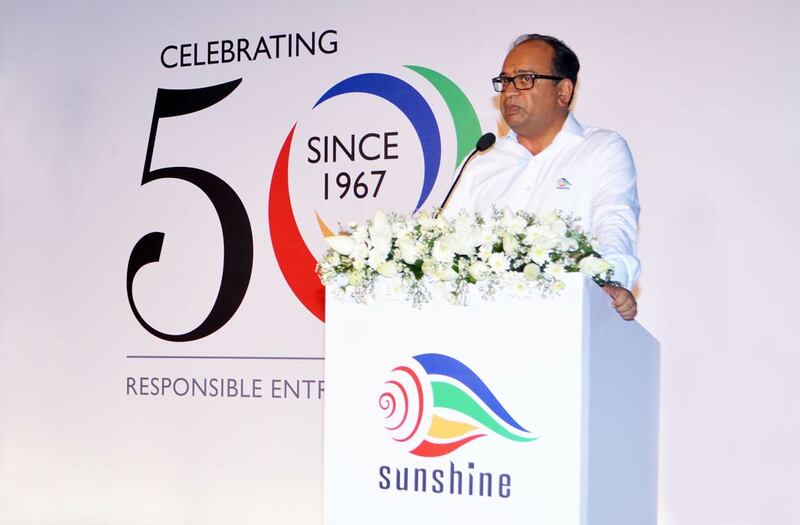 Sunshine Holdings PLC began its entrepreneurial journey in 1967 through the establishment of its presence in the Sri Lankan healthcare segment, with the opening of Lanka Medicals – a retail pharmacy in Gampola. In 1977, the company opened its second store in Kandy, the country’s first ever ‘supermarket’ style store where people could shop for pharmaceuticals, home appliances, food products and imported cosmetics under one roof, an unprecedented development in the domestic retail market. Alongside the retail business, the company established an island-wide pharmaceuticals distribution business, which enabled them to acquire a thorough understanding of the local healthcare market and build partnerships with leading international healthcare companies. Today, Sunshine Healthcare retains a substantial 20% share of the private healthcare market, supplying over a thousand pharmaceuticals, nutraceuticals, medical diagnostic equipment and surgical products to over two thousand pharmacies, clinics and hospitals across Sri Lanka. The Healthguard pharmacy chain was set up by Sunshine Healthcare with the aim of offering a range of pharmaceuticals, wellness and beauty products in a modern retail environment, and has established a benchmark for healthcare retailing in the country. The leading pharma retail brand in the country now has 24 pharmacies across the Greater Colombo area. In Agribusiness, Sunshine Holdings manages more than 12,000 hectares and employs close to 15,000 people through its subsidiary, Watawala Plantations PLC (WATA), Sri Lanka’s number one plantations company. WATA is a diversified company managing 15 tea estates and 4 palm oil estates located in Central and Southern provinces, with 14 tea factories and the largest oil palm mill. WATA has consistently been the highest market capitalized regional plantation company and has won many accolades for sound agricultural practices and financial management standards. The group’s Consumer business, Watawala Tea Ceylon Ltd has become the largest branded tea company in Sri Lanka with the highest market share in the tea category of 35% with three brands: ‘Zesta’, ‘Watawala Tea’ and ‘Ran Kahata’ catering to three distinct market segments. Having built a strong foundation locally, the company has embarked on an expansion program to capture selected international markets by launching ‘Zesta Connoisseur’, an extension of Zesta to cater to premium international customers. The company is the exclusive tea supplier to Shangri-La chain of hotels, servicing 100 luxury hotels spread across 22 countries. Recently, Watawala Tea was recognized as the most popular hot beverage brand of the year at the SLIM-Nielsen people’s Awards 2017. Over the last five decades, Sunshine Holdings have entered into strategic partnerships that have helped the group to expand its presence locally and globally. Most notably, the partnerships with Tata Global Beverages – the world’s second largest tea company and Wilmar International – the world’s largest oil palm and edible oil company. The Group’s sound fundamentals continue to be reflected in its financial performance for 2016, with Sunshine Holdings posting a 10.1% Year-on-Year (YoY) increase in consolidated revenue up to Rs. 14.1 billion during the 9 months to 31st December 2016 and a 27.7% YoY increase in Profits After Tax up to Rs. 1.3 billion, bolstered by strong performances in its agri business which posted revenues in excess of Rs. 4.7 billion, up 2.7% YoY. Healthcare revenue during the same period rose by 10.5% YoY to Rs. 5.6 billion while the Group’s thriving FMCG portfolio posted a 19.5% YoY increase in topline performance up to Rs. 3 billion.